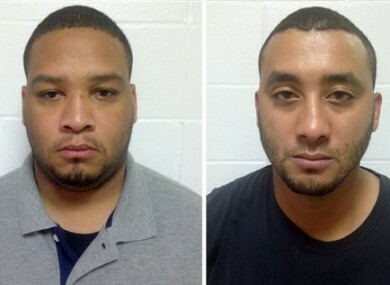 Marksville City Marshal Derrick Stafford, left, and Marksville City Marshal Norris Greenhouse Jr were both were arrested last week. A POLICE BODY camera recorded the father of a six-year-old autistic boy with his hands up and posing no threat as police opened fire into his car, severely wounding the motorist and killing his son, the man’s lawyer said today. “This was not a threatening situation for the police,” said Mark Jeansonne, a lawyer for Chris Few, who remains hospitalised and could not attend the funeral of his son, Jeremy Mardis. Jeansonne spoke with The Associated Press after a closed hearing in a Louisiana jail where he said the two suspects were being held on $1 million bonds. Derrick Stafford, 32, of Mansura, and Norris Greenhouse Jr, 23, of Marksville, are both charged with second-degree murder and attempted second-degree murder. The lawyer said he still hasn’t seen the video, but its contents were described to the judge during the hearing. He also said that while Few’s condition is improving, he has not yet been told that his son died at the scene. Local police declined to comment, citing the ongoing investigation. The possibility that the officers could post bond and be released today, despite the murder charges, didn’t sit well with some townspeople who gathered outside the jail. Louisiana police announced late on Friday that they had arrested the two law enforcement officers in Tuesday’s shooting, which raised questions from the start. Initial reports suggested the marshals had been serving a warrant on Few, but Louisiana’s state police chief, Mike Edmonson, said there was no evidence of a warrant, nor was there a gun found at the scene. State police said the boy died wearing his seatbelt in the front passenger seat. “It’s the most disturbing thing I’ve seen — and I will leave it at that,” Edmonson said. Jeremy Mardis is 6 years old. He didn’t deserve to die like that. The boy was mourned today at his funeral in Hattiesburg, Mississippi, where he lived before moving with his father recently to Louisiana. Outside the funeral home, Anita Bonnette, the assistant principal from Lafargue Elementary School in Effie, Louisiana, said the school brought in a crisis team to counsel Jeremy’s classmates and teachers. “He was just a very sweet loving little boy who enjoyed being at school and enjoyed his friends,” she said. Email “"This was not a threatening situation": Anger as police charged with killing boy (6) ”. Feedback on “"This was not a threatening situation": Anger as police charged with killing boy (6) ”.